Very cool new iPhone app just out called Air Photo that allows printing directly from an iPhone to a printer connected to a computer. Basically, you download a Mac or Windows software program called Air Photo Server, then head to the iTunes store to pick up the Air Photo client, which is $2. Then you can just use WiFi to connect your computer and your iPhone, and away you can go. 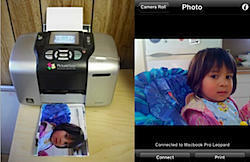 For owners of HP InkJets, this technology already exists in a free app called HP iPrint Photo, but this is the chance for people with other kinds of printers to get in on the action. I think the scenario of use for this technology that I like best is treating the iPhone kind of like a Polaroid camera at a party. Walk around taking pictures, then have them start printing from across the room. Just get more of a keepsake feel to the whole process. More organic.